This is what Kansas is doing as of March 15,2008. I contacted Mr.DaveD and Mr.cantuland. cantuland gave me the above link to the upcoming geocaching event. were ordered before I started working for them. hard-core GPS coordinates on a mark like that. Series, January 10, 11 and 12, Thursday through Saturday. in Kansas and either the seventh or eighth geocache ever. couple of weeks where we will give presentations on this new process. If Ernie is there it would be a good time to discuss this activity. I just thought I would start this to keep us an update on how things go and are going. I also know many things can happen and will be happy with which ever way this goes. I hope we could all meet for this moment in time and reflect upon the future of what we are doing for the good of the Nation. I am Honored and still humbled by such possitive response when I write to these great people within our benchmark community. Thanks for the update. The US POWER SQUADRON did not have to go to all this trouble to get DE5174; nor did they have to pay for their mark. It was set for them by the government. The commemorative marker for the U.S. Power Squadrons was set by the National Geodetic Survey at the direction of the National Ocean Service, Office of Coast Survey in recognition of the 40 years of active national service provided by the Power Squadrons to the National Cooperative Charting Program -- http://nauticalcharts.noaa.gov/MCD/uspscoop/index.htm, which has been of invaluable assistance in our efforts to produce and maintain the most accurate and up to date nautical charts for safe navigation. The recovery of geodetic control markers was only a very small footnote in the rational for setting this mark. I feel that 40 years deserves a BM of their own. We have not been at it no where near that long. But I hope we have and will continue to provide accurate up to date data as well. In 33 years maybe we could get a COMMEMORATIVE disc set as well. If I(we) have to purchase one I will work on some way to promote and come up with some of it maybe all. Just depends on how all things go. I can not promise you anything. I am working on it now. As I noted in my previous post, with the enhancement to OPUS coming in a few months NGS will be creating a mechanism that will allow surveyors with dual-frequency GPS to quickly get new monuments into a database that will reside at NGS - we call it OPUSDB. We are already working on this with the U.S. Army Corps of Engineers. Surveyors who want to have their data published will need to register with NGS and give their permission for these data to be made available. 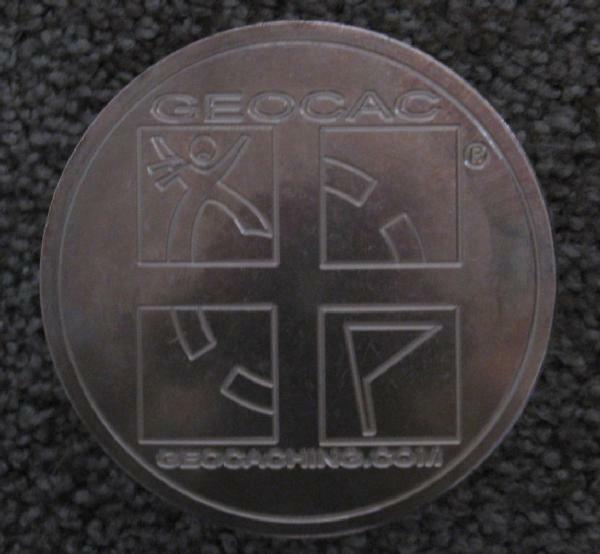 It would be possible to have special geocaching marks set and published if this community would work with the National Society of Professional Surveyors (NSPS) and get them involved. Ernie Cantu from Kansas has taken a leadership role in this and may be a good place to start. The USPSQD's contribution is acknowledged. I was just thinking that with the large number of new benchmarks placed every year in the United States, how difficult would it be to occasionally name a station GEOCAC? Granted, it's not as colorful as DEAD DOG, SNAFU, and KUDZU. But it would be cool to have some stations with that name sprinkled here and there around the country. Sometime in 2008, we should hit the milestone of 25,000 NGS recovery reports--many of which are the first update in over 20 years. If you have a chance, please consider throwing a bone to the dogs--soon. Some of us won't be around in 33 years. Hear hear! And if we are around, we will probably be having problems with BMs of a different sort. And if we are around, we will probably be having problems with BMs of a different sort. Now, Brendon.....You could have gone all day without saying that! Wait !!! I am having... never mind. I don't think we will have to wait that long.....I hope!! The '08 Tour has been published! and also with GC waypoint GC15XVW. I have written to Groundspeak. No reply yet but with the Holidays it will be a while. I will post what I get. I hope we can get something really nice going for this next year. I know the Meads Ranch will be awesome and will see what we can do to add to it. I am still pondering this years contest. If you are really enthusiastic you could contact your States Geodetic Advisor and ask if they are looking into setting any new marks for NGS Publication. I am in that process as of the New Year. I hope to be out there more this New Year but things may be tight still for a while. I will do the best I can and hope you all have a very prosperous New Year. Thanks Ernie It still amazes me the way things clicked on this. We are still in the process of getting things lined out. I will keep you updated things are really looking good is all I can say right now. This looks like fun, I'll definitely try to keep that weekend clear for this. I will be in NE Oklahoma visiting relatives the weekend of the event. I'll see if I can make the "side trip". Looks like fun! As of this moment things are looking realllllllllllllllllllllllllllllllllllly good for this. Everything is just falling right into place. I would like to see a GEOCAC Benchmark in all 50 States. 1.Contact your State Geodetic Advisor and see where your State stands on this. And see if you can get it done for your State. 2.You will have to get with a State or County Surveyor to help with setting the mark,that is if you are not a surveyor yourself. I am going through The State Geodetic Advisor for Missouri and MSPS (Missouri Society of Professional Surveyors). 3.Keep us up to date here on all the details. I know we do not have benchmarkers in all 50 States but maybe one of us can do 2 or 3 states. Once I have Missouri done I will look into getting Arkansas and New Mexico. If someone does not beat me to it. I am working on some other details at the moment that until they are approved by Groundspeak I can't mention it yet. But it will be a way to help us out,hopefully. So this next week should be full of answered e-mails across the Nation so as it becomes available I will let you all know. Let me hear some thoughts on this. Can you give us a step by step description on how you accomplished this? It would help us to work with the other states. It has not been accomplished yet. But here is what I have so far. If your state is not on the list my first step would to be to get with a licensed surveyor from that said State and see about getting added to the list. There is a link on the page. The next thing I did was I contacted Ernie(cantuland). There is a list on the Meades Ranch events page that leads to other Surveying Societies. I then called and joined the Missouri Society of Professional Surveyors. Some offer a membership even if you are not a surveyor. I wanted to do like cantuland is doing on getting Geocacher/Benchmarkers and surveyors together. And placing geocaching/survey related caches..and hopefully a benchmark. It is through these connections and the call I placed to Groundspeak. Most of this is still in the planning stages so I am just posting it as I can. There are many things still going on behind the curtian so I have to wait to explain those. Because some of it has not been approved and I would hate to lead someone in the wrong direction. The Artwork has been approved. Berntsen is working on the benchmark now. And we should get to see it before long. I think we will have a separate Event for the setting of the mark. I still need to talk to cantuland about this though. We are also still working on just the right place to set it for maximum benefit. Just thought I would drag this up to the top again since some things are happening. Great news! I just set the first-ever (I think) "GEOC" benchmark! It would've been "GEOCAC", but my estimating skills were off when deciding on which size stamps to get..
Maybe you should have made it G I C now. As soon as I get the benchmark I will add images of it as well. It will be a domed 4" Benchmark. PS - Should you have a dot in the center for the survey parties? Hey, with a little rigging up something, that could replace the Geocaching trailer hitch cover on my Jeep with one of those! Yeah, that could work. Count me in for at least one. Nice design, also. According to GC Policy on the logo I can't add anything. What someone else may want to add later is not up to me. But for approval it has to be clean. Hadn't thought of that one. A drilled hole and a keeper. I am not sure on what Berntsen will have and we have not talked in details on it either. 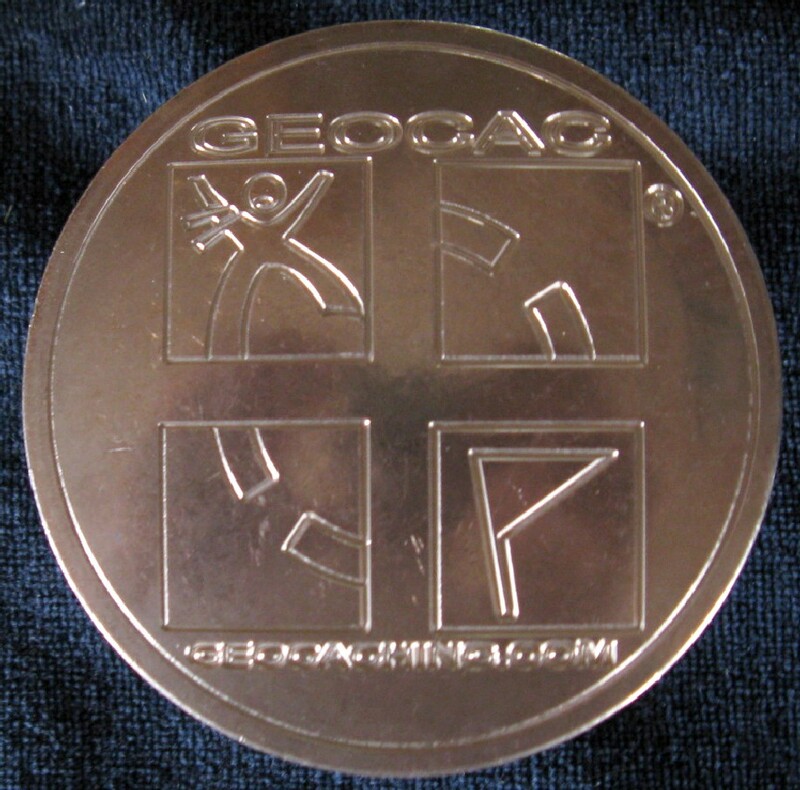 I am still waiting to post the Geocoin as we are still working out details. Thanks for the replies guy's. Hey Hey look what came in the mail today. 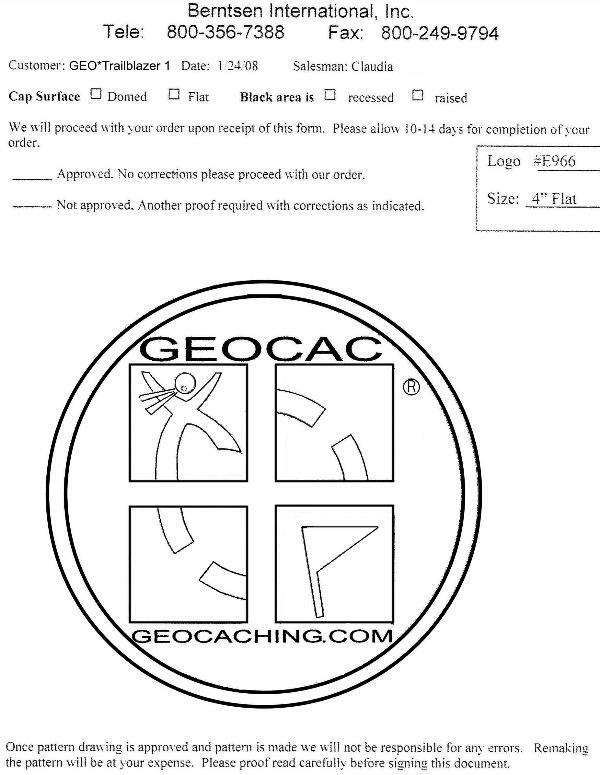 A 4" Benchmark for GEOCAC. Thank you so much Berntsen! You are awesome and did a great job. Now to get it up to cantuland so we can christen it at the Meades Ranch Event, March 15,2008. I got some better images of the benchmark. OK, looks good! So, what's the deal on these? You selling them, or is Berntsen? $? "OK, looks good! So, what's the deal on these? You selling them, or is Berntsen? $?" The Proto Type to be set near Meades Ranch Kansas. I am not selling them and I am in talks with Berntsen now. I am hoping to do 50,One for each US State. 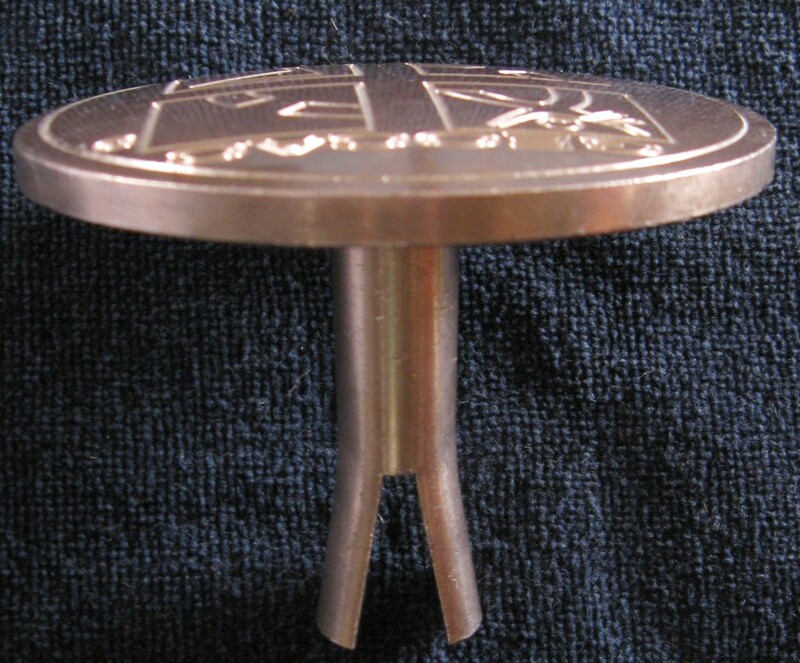 I am hoping that with the geocoin that is coming out to gather support to offset costs...which will never really cover all of it but at least some of it. I will let all know if they will be available to the Public when we get through with all the details. I am hoping that other get involved in their state to help to get one set and added to the NGS Data base. Me, Missouri,Arkansas and New Mexico. Can we add your name for California? Sure! We'll do what we can. Will have to get hooked up with some local surveyors. Might Start with the Claifornia State Geodetic Advisor. I contacted ours and he said they would provide the GPS. I joined the MSPS Missouri Society of Professional Surveyors. I am not a surveyor yet....................but an interested party. They allowed me in imagine that. I am in contact with a Newly joined member at geocaching for MSPS they have started placing geocaches as well. Now they want to know more about this project. This is gonna be a fun adventure. 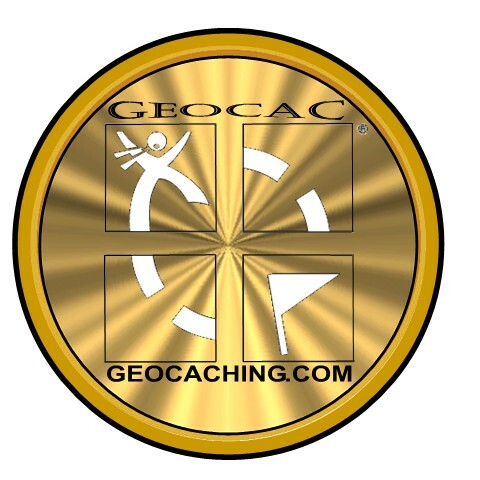 added link to California Geodetic Advisor. added link to main map. Hmmm.... I wonder if we can get this done in Alaska? I like the receiver hitch fill plug - I'd buy it in a heartbeat for my NitroCACHER. Hey one way or the other Nortwes. I have a good feeling that it won't be as expensive as we think. I am still waiting on a reply from Berntsen on the price per unit and a bulk price as well. Do not think I can do the bulk one quite yet but maybe we will have a big help from some sponsors we can work things out. I will keep you all updated as I get it. I have got 2 States involved now. I have been in contact with Berntsen and if we do a run of 6 Benchmarks at a time they will be much cheaper. I need 4-5 States to get on board so we can make an order of 6. All interested can contact me again and we can talk about all the cost involved. I am also going to speak at the MSPS (Missouri Society of Professional Surveyors)monthly meeting this Tuesday and go over details. I also have a document that Ernie (cantuland)has compiled and should be available to all real soon. Hopefully we can streamline it all to make it easier for the rest of the States to get on board. So contact me again and we will get things going. Okay, idiot question.. but if you're going to set it, doesn't it need to have a center point / mark? According to the Logo use policy there can be NOTHING there. Now what happens after it is set and the plumb line marks a spot. Just adding an update to where we are at. I have ordered 6 of the Benchmarks and was trying to get some community help with it. I have already mustered lots of support but would like all to get involved in some way or other. Still more finds than Forum posts. I would like to help out as well. I am in NJ, but have no contacts with the state. I would buy a disk, coins, whatever might help. I am in contact with the Wisconisn advisor and he seems very interested in this project. Will keep you updated. GEO*Trailblazer 1 published an article today in The Online Geocacher that may be of interest here. I am going to be all over this for Alabama! I just got off the phone with Mr. Doyle (DaveD) with the NGS. 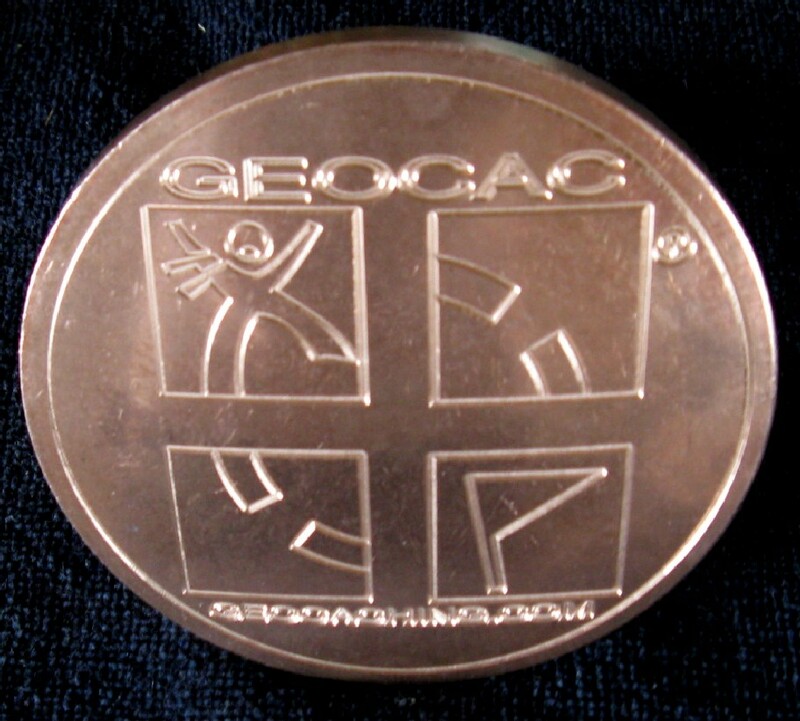 The word is getting out and all of the State Geodetic Advisors are aware of the new GEOCAC project. We also spoke of how this is a great way to educate those who may not be aware of all the technical issues that go into Mapping and how our GPS really works. If you are in another country besides the US and would also like to get involved e-mail me through my profile. There are some pilot projects that may be used in helping us in other Nations and Countries. I am working on the writeup to make this a little easier for those who have already shown interest and will get it out ASAP. I just wanted to clear up some trivial things that are also part of the project. Thank you all once again for your continued support of this project and look forward to working with all of you. It figures, redneck Georgia wouldn't have one. Is it an open position? Can I apply? I'll be looking into this method then! Yes that is a great link to the States, and to the NGS Advisors. NGS is currently in negotiation with the Georgia Department of Transportation to host an advisor position. OK, so I would like to help out with this, but if I call the state advisor I am not sure what to say. Is this something NGS is pushing or would that be my job to “push”? I eagerly await your write up so I know what is involved and what my role in this would be. Dave - You should have my e-mail, I think. You've contacted me before. I'll wait on contacting SAMSOG (Georgia's Surveying and Mapping association) then until I see if anything happens with that. My plan was this. I'm making it public for any comments and to help others. 4. Express my willingness to work with them in almost any way in seeing this project to completion. Breaking Radio Silence to state that I have attempted contact with the AZ State Advisor. Since neither UT nor NV have State Advisors, I may be able to help out there as well...no promises.